Chad: Hello Monsieur Ouellet! Can you introduce yourself to our readers? Daniel: My name is Daniel Ouellet. I’m a teacher at Centre Scolaire Samuel-de-Champlain in Saint John where I teach many different high school level classes. You have a new lab at the school. Could you talk about it? Last year, one of my colleagues, William Duncan, decided that he wanted our school to have a lab where students could be exposed to tech in the hopes that it would develop a curiosity about modern tools and the skills to operate them. The model for such a lab was already out there with concepts such as Maker Spaces and Creative Labs so Mr. Duncan communicated with these organizations and managed to get funding for equipment with which to start our own Creative Labs. At the same time, I was already working a lot on ideas for how to get more gaming into the classroom. This is how I got involved with our Creative Labs team. At the start we had a little trouble getting our projects going. Mr. Duncan assembled a team of students who specialized in 3D printing. They used these skills to build flyable drones and functioning wheel chair kits that could be made on a low budget. 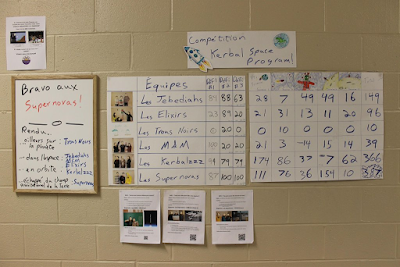 On my side of things, I organized a competition of game called Kerbal Space Program. It’s a physics simulator in which the player can build and fly rocket ships. We did that for a few weeks with quite a bit of fun. This year we really made an effort to give more structure to our lab. I started out by making a little game that showcases our lab and some of the things we do there. The game acted as a recruitment tool. We now have 15 to 20 students showing up EVERY DAY. This has made it possible to have a structured schedule and to offer more workshops. One day the students come create video games with me, another day they’ll do robotics with a colleague of ours, Raymond Losier, on day 3 they’ll work in teams on entrepreneurial problem solving with Mr. Duncan. We also have a day to learn electronics where students can work with LittleBits and Arduinos. Our most popular day, though, is Minecraft Club where students work together to create a scale model of our school in the game. We’ve also had 3D design workshops on SketchUp offered BY a student. It’s really impressive to see the students be so passionate. Impressive! So if I understood correctly, you sometimes create games in class? Personally, I use a lot of games in my classes as a platform for learning but I haven’t gotten to the point yet where students are invited to create their own games. The classes and grades that I teach are not yet well adapted to efficiently using games in that way. The main problem is the required time to show students HOW to use the creation platforms. I can see this being possible in a few years when my students will be those that will have been through our Creative Lab. Mr. Duncan, however, teaches english classes in which students learn narrative structure. What he does is he permits students to hand in their stories in the form of video games. One software he uses, for example, is Twine, which is designed to create “Choose your own adventure” stories. Students can therefore explore alternative narrative structures. Where we mostly create games, though, is in our Creative Lab, where we’ve recently started our own game studio. I had about 20 students interested in game creation and some of them hadn’t had the chance to attend my RPG Maker workshops yet. This created a situation in which I needed to get them involved but had to do it in a way where they didn’t need weeks of catching up on coding. So I divided everyone into teams of different skills. I have three teams on level design, one of game balance, two teams are working on characters and story, one student is working on puzzle creation and a few students are working on art aspects. Together, they’re trying to create a game about our school. I’m amazed by them. That's really interesting! You also mentioned a software called Classcraft. Can you explain it for us? 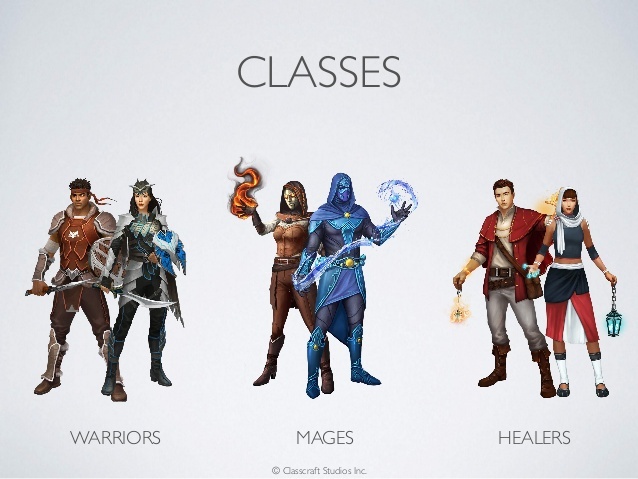 Classcraft is an online program that is meant to help with class management and does so in the form of an RPG. Essentially, each student creates a character that represents him in the game. Characters can be warriors, mages or healers. The students progress by having appropriate behaviors. As an example, if a student hands in an assignment on time, he receives game points but if he is late to class, he loses points. With the accumulation of enough points, the student “levels up” and can improve his character in multiple ways (costumes, new powers, new pets, etc.). The students have powers that give them special permissions like being able to leave class to go to the bathroom or being allowed to take a break from homework. All of that is completely customizable. I started using Classcraft in September by testing it with only 1, and later 2, of my classes. Appreciation was unanimous. Even the students least interested in the game admitted to liking it. Some students became almost obsessed with it, trying to find as many ways as possible to gain points and become the points leader! (It is worth noting that in theory, Classcraft is a collaborative game that is not meant to have any competition in it...but some of my students are very competitive. :P ). I don’t know if the game improved my students’ results. I’m too much of a skeptic to say such a thing without first taking a hard look at the data. I do know, however, that is positively affected motivation and that Classcraft also helped reduce certain types of bad behavior like students leaving class to go loiter in the halls. They’d much prefer stay and not lose points! Everyone, including myself, has had a lot more FUN in class with this game. Why do you think it is useful to include video games in the classroom? I think there are two keys to success in teaching : motivation and healthy relationships. Games help both of these aspects of the job. Almost everyone likes playing. There is a natural desire to learn when learning means having fun. Playing games also helps developing a good rapport with students. In Classcraft, we can make the game randomly chose a student to answer a question. It has given me the opportunity to better know my quiet or shy students and it has helped them develop some confidence. They appreciate that it is an algorithm that is targeting them and not I. It is also a very social game (most games are). The students are grouped up in teams and must cooperate in order to get the most points. I’ve seen many students help each other with school work that normally would not speak to each other before Classcraft. I noticed the same thing during Kerbal Space Program competition last year. We try to offer players some challenges that they will be able to overcome and learn from. Change the word “players” with “students” and you’ll easily understand why gaming and teaching are intimately linked. Thanks a lot to Monsieur Ouellet for the interview! Follow him on Facebook, YouTube and Twitch! Chad : Bonjour Monsieur Ouellet! Est-ce que tu pourrais te présenter à nos lecteurs? Daniel : Mon nom est Daniel Ouellet. Je suis un enseignant du Centre Scolaire Samuel-de-Champlain à Saint Jean où j’enseigne plusieurs cours au niveau secondaire. Vous avez un nouveau laboratoire à votre école. Parle-nous de ça. L’année passée, un de mes collègues, William Duncan, a décidé qu’il voulait que notre école ait un laboratoire où les élèves pourraient être mis en contact avec des appareils technologiques dans le but de développer une curiosité, mais aussi des compétences, avec ces outils modernes. Le modèle existait déjà ailleurs sous la forme de Labos Créatifs, alors M. Duncan a communiqué avec cet organisme et a réussi à avoir des fonds et du matériel pour commencer notre propre Labo Créatif. Parallèlement, je travaillais déjà beaucoup avec l’idée d’apporter plus de jeux et de technologie dans la salle de classe. C’est par cette voie que je me suis joint à l’équipe du LaboCréatif. Au début c’était un peu difficile à lancer les projets. M. Duncan s’est amassé une équipe de quelques élèves qui se sont spécialisés dans l’utilisation de l’imprimante 3D et qui l’ont utilisé pour concevoir des drones et un fauteuil roulant. De mon côté, j’ai organisé une compétition d’un jeu qui se nomme Kerbal Space Program. C’est un simulateur dans lequel on peut construire et faire voler des fusées spatiales. On a fait ça pour plusieurs semaines avec beaucoup de plaisir. Cette année, on s’est vraiment lancé à donner plus de structure à notre Labo. J’ai d’ailleurs fait un petit jeu qui présente le LaboCréatif de notre école pour faire un peu de publicité auprès des élèves. Nous avons maintenant de 15 à 20 élèves qui se présentent au LaboCréatif à CHAQUE JOUR. Cela nous permet d’avoir un horaire plus structuré et d’offrir plus d’ateliers d’apprentissages. Une journée les jeunes viennent créer des jeux vidéo avec moi, une autre ils font de la robotique avec notre collègue Raymond Losier, une autre journée ils travaillent en équipe sur des projets entrepreneuriaux avec M. Duncan. Nous avons aussi une journée pour apprendre l’électronique où les élèves travaillent avec des LittleBits et des Arduinos. Notre journée la plus populaire est probablement celle du Club de Minecraft où les élèves travaillent ensemble à construire notre école à l’échelle dans le jeu. Nous avons aussi eu des ateliers de design 3D dans SketchUp donnés PAR un élève. C’est vraiment impressionnant de voir les élèves aussi passionnés. Impressionnant! Donc si j'ai bien compris, vous créez parfois des jeux en classe? Personnellement, j’utilise beaucoup les jeux comme plateforme d’apprentissage dans mes cours, mais je ne suis pas encore rendu à inviter les jeunes à créer leurs propres jeux. J’enseigne des cours et des niveaux où ça ne serait pas tout à fait efficace je crois. Le problème principal est le temps nécessaire pour montrer aux élèves COMMENT utiliser les plateformes de créations. J’envisage que ça serait possible dans quelques années où mes élèves seront ceux qui auront passé par le LaboCréatif. M. Duncan, cependant, donne des cours d’anglais dans lesquels les élèves étudient les structures narratives. Ça lui permet de proposer aux élèves de s’exprimer sous la forme de jeux vidéo. Par exemple, il permet aux élèves d’utiliser Twine pour écrire leurs histoires non-linéaires. Là où on crée la plupart de nos jeux c’est au LaboCréatif, où nous avons commencé notre propre studio de jeux vidéo. J’avais une 20aine d’élèves intéressés et certains d’entres-eux n’avaient pas encore eu la chance d’apprendre RPG Maker. Ça m’a inspiré à créer des équipes. Maintenant on travaille tous ensemble comme un grand groupe qui essaye de créer un jeu vidéo à propos de l’école. J’ai trois équipes qui s’occupent de la création des plateaux, une autre qui s’occuper de l’équilibre des attributs mathématiques des batailles, deux équipes qui travaillent les personnages et l’histoire, un élève qui est responsable des casse-têtes et labyrinthes et quelques élèves qui travaillent sur l’art. Ça sonne comme un processus amusant! Tu m'avais aussi parlé d'un logiciel nommé Classcraft. Est-ce que tu pourrais nous l'expliquer? 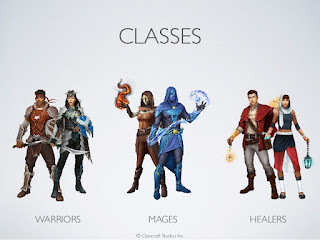 Classcraft c’est un logiciel en ligne qui aide à faire de la gestion de classe... sous forme de jeu de rôle. Essentiellement, chaque élève se crée un personnage pour le représenter dans le jeu. Le personnage peut soit être un guerrier, un mage ou un guérisseur. Les élèves progressent dans le jeu en ayant des comportements appropriés dans la classe. Par exemple, si un élève remet son travail à temps, il reçoit des points, mais s’il arrive en retard au cours, il perd des points. Après l’accumulation d’un certain nombre de points, l’élève gagne un « niveau » et peut améliorer son personnage de plusieurs façons (costumes, nouveaux pouvoirs, nouveaux familiers, etc.). J’ai commencé à utiliser Classcraft en septembre en le testant seulement avec 1 et ensuite 2 de mes classes. L’appréciation était unanime. Même les élèves qui étaient moins intéressés par le jeu ont avoué avoir aimé ça. Certains élèves sont devenus presque obsédés, essayant de trouver le plus de moyens possibles d’obtenir des points pour être celui qui en avait le plus! (À noter qu’en théorie, c’est un jeu complètement collaboratif et qu’il n’est pas sensé avoir de compétition du tout… certains de mes élèves sont juste particulièrement compétitifs :P). Je ne sais pas si Classcraft a amélioré les résultats de mes élèves. Je suis trop d’esprit critique pour énoncer une telle chose sans vraiment analyser les chiffres à fond. Je sais cependant que la motivation des élèves a été positivement affectée par le jeu et que Classcraft a aussi aidé à gérer certains comportements dérangeants comme les sorties de classes. Les élèves préfèrent rester en classe que de trainer dans les corridors pour ne pas perdre de points! Et puis tout le monde, incluant moi, a beaucoup plus de plaisir en classe avec ce jeu. Pourquoi penses-tu que c'est bon d'intégrer les jeux vidéo dans les salles de classe? Je pense que la clé du succès en enseignement est double : la motivation et la relation interpersonnelle. Les jeux aident beaucoup sur ces deux fronts. Presque tout le monde aime jouer. Ça donne envie d’apprendre quand apprendre veut dire avoir du plaisir. Le jeu aide aussi à établir des liens avec les élèves. Dans le cas de Classcraft par exemple, on peut demander au logiciel de choisir un élève au hasard pour répondre une question. Ça m’a permis de connaître les élèves plus silencieux et ça aidé ces élèves à développer une confiance. Ils apprécient que c’est l’algorithme qui les vise et pas moi :P.
De plus, c’est un jeu très social (plusieurs jeux le sont). Les élèves sont en équipe et doivent coopérer pour avoir le plus de points possible. J’ai vu plusieurs élèves s’entre-aider avec la matière qui ne l’auraient pas fait avant Classcraft. J’ai vu la même chose quand j’utilisais Kerbal Space Program l’année passée. On cherche à donner des défis aux joueurs en espérant qu’ils réussissent à les résoudre. Changez le mot « joueurs » pour « élèves » et vous comprendrez facilement comment les jeux et l’enseignement sont liés. Merci beaucoup à Monsieur Ouellet pour l'entrevue! Suivez-le sur Facebook, YouTube et Twitch!